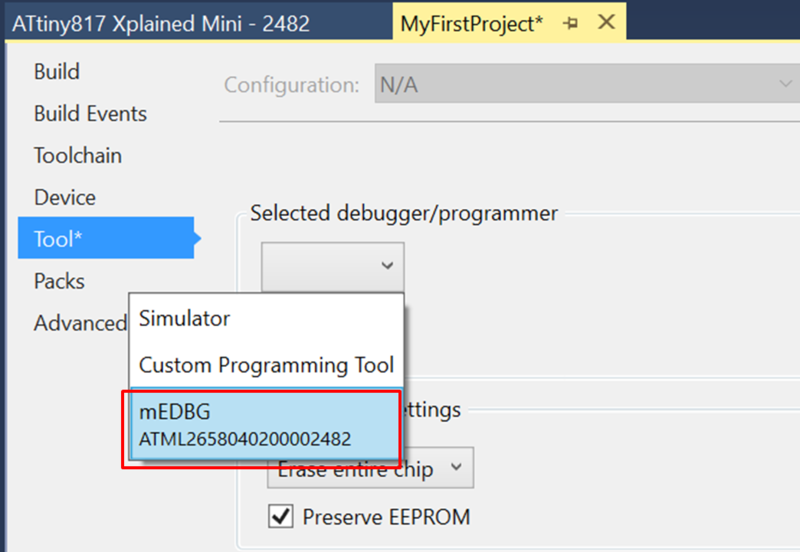 This short tutorial will show you how to select and change the debugger platform for the currently selected project. The ATtiny817 Xplained Pro kit has an on-board embedded debugger (EDBG) which eliminates the need for a dedicated programmer / debugger. This page will go through the process of associating the EDBG with your project. Click the Tool button located in the top menu bar to open the Tool tab. Select tool/debugger from the drop down list. The Tool tab of the Project Properties window will open. In the drop-down menu, select the 'EDBG' tool. The serial number of the tool will accompany its name in the drop-down menu. This serial number is printed on the back side of each tool, allowing differentiation when more than one is connected. These steps can always be repeated if a different tool should be used for the next debug/ program session. On the ATtiny817 Xplained Pro, the EDBG is permanently connected to the target MCU, but for a custom hardware solution is it necessary to ensure the target device is powered and properly connected before a debug session can be launched. To learn more about the other settings in the Tool tab, please visit the Tool options section in the Studio User Guide. You can verify the tool and project configuration setup by compiling the empty project and writing it to the ATtiny817. 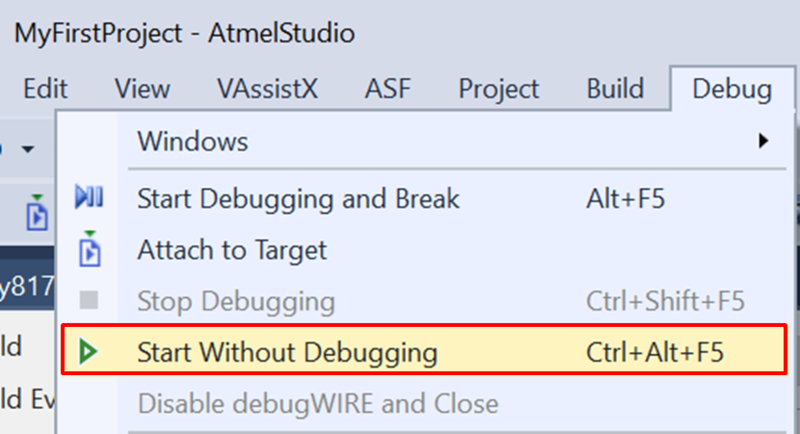 Click on 'Start Without Debugging' located in the Debug menu. This will compile the project and write it to the specified target MCU using the configured tool. 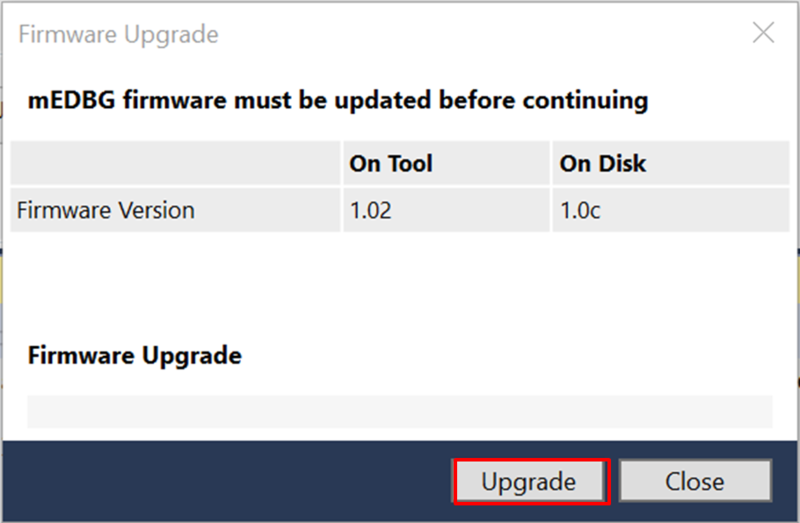 If there is new firmware available for the selected tool, the Firmware Upgrade dialog will appear. Click the Upgrade button to start the firmware upgrade. Depending on the state of the connected tool and the actual firmware upgrade, the upgrade may fail on the first attempt. This is normal and can be resolved by disconnecting and reconnecting the kit before clicking Upgrade again. After the upgrade has completed, the dialog should say "EDBG Firmware Successfully Upgraded". Close the dialog box and make a new attempt at programming the kit by clicking on 'Start Without Debugging' again.